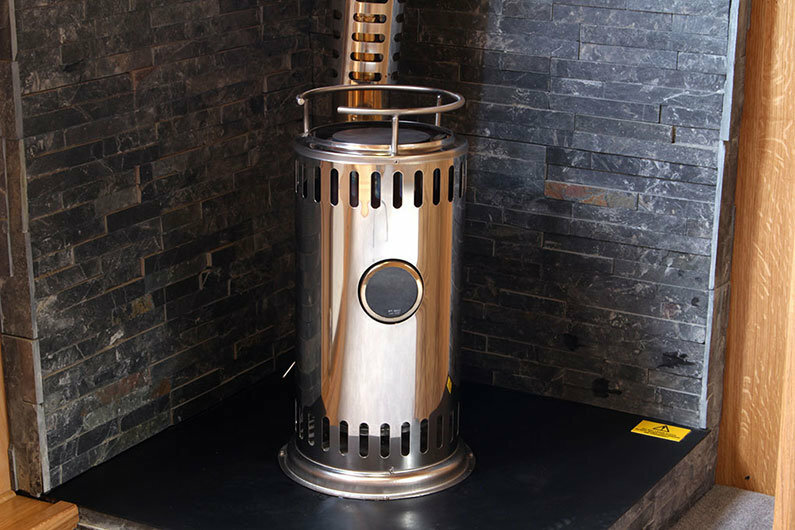 A common alternative to the Solid Fuel Stove is a stand-alone Diesel Oil Fired Stove Space Heater. Available in a wide variety of styles and finishes, including stainless steel, there will be a design to suit all tastes. 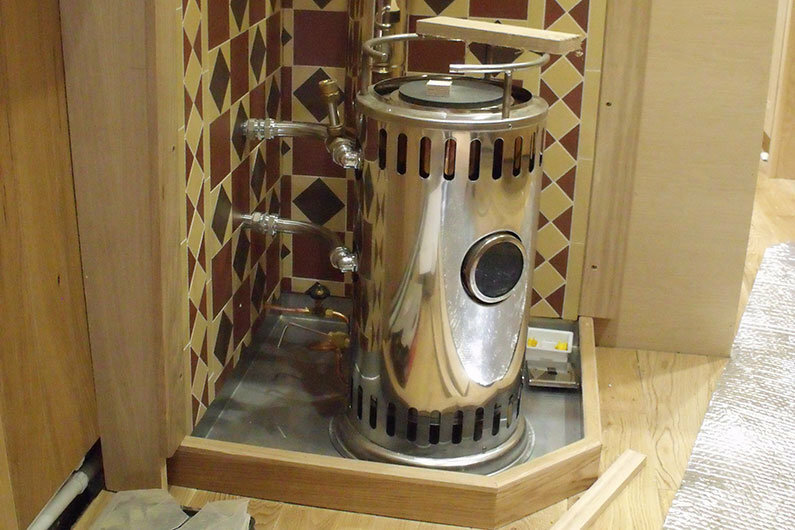 Some oil fired stoves can be supplied with a water heating coil to supply a small radiator whilst others can be connected to a calorifier to provide a domestic hot water source for your narrowboat. These heaters are supplied directly from either the narrow boat engine diesel tank or a separate dedicated heating oil tank usually fitted in the bow. Simple to maintain and easy to use, they are a clean and efficient form of heating for your narrowboat. Diesel or oil fired stoves are equipped with simple no-moving components. Oil is fed via a metering valve to a vapourising burner. The fuel vapourises by natural draft to burn cleanly. Some models have a viewing window where the burning flame adds ambience to the location of the installation. 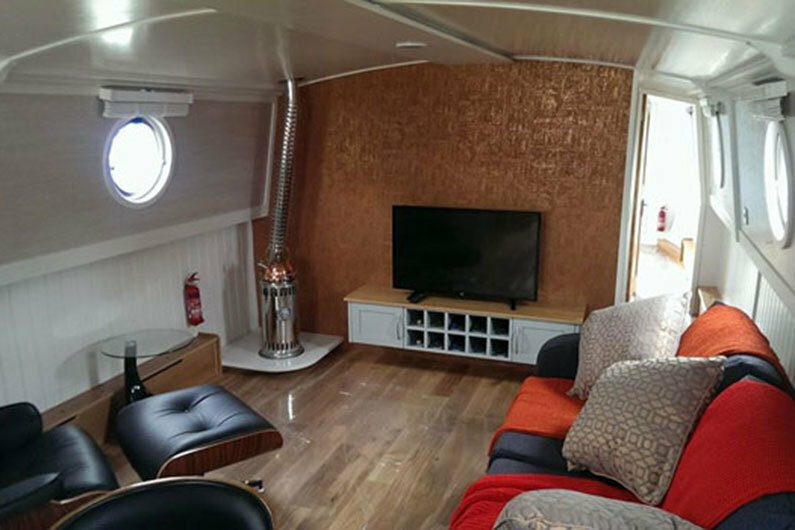 It is imperative to ensure there is enough unrestricted free ventilation on your narrowboat as any air that the stove uses for combustion must be replaced. It is also recommended to fit a carbon monoxide detector. 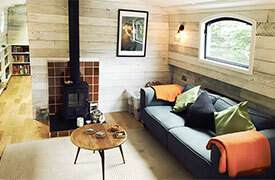 A canal boat builder will be fully aware of the amount of ventilation required on a narrowboat. However, if you are self-fitting out a sailaway widebeam or canal boat, ensure you have calculated your ventilation correctly as this will form part of your Boat Safety Certification. 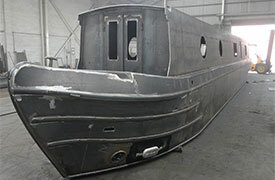 It is good common sense to use a model that is recommended by the manufacturer for use in narrow boats. Always refer to the manufacturers installation instructions and with regards to the Boat Safety Scheme as advised by your local BSS examiner. Diesel fired stoves and un-insulated flue pipes can be a burn hazard and can become hot enough to ignite surfaces, paint & other combustibles a fair distance away. As mentioned above, the basic principle is burning with natural draft so ensure your narrowboat has sufficient unrestricted ventilation to replace the air used by the heater. If you are retro-fitting a diesel fired stove to a boat with no previous heating, you may need to increase your fixed open ventilation. Consideration has to be given as to how to deliver the oil to the diesel fired stove. The simplest method is to use gravity. Diesel can be drawn either directly from the narrowboats fuel tank or from a separate dedicated heating oil tank. Most narrowboats are trimmed bow high so if using gravity to feed the oil from a rear fuel tank be mindful of what happens to the oil flow as the front water tank empties and the bow rises. For this reason, some forward stove installations utilise a forward diesel tank which, hopefully, remains above the burner level regardless of trim. Remember, if you are tapping into your engine fuel tank please ensure your stove fuel feed pipe is situated higher in the tank than your engine feed pipe. This will ensure that your Diesel Fired Stove will not drain your fuel tank totally and you will still be able to run your engine to cruise to buy more fuel. Better to be cold and mobile rather than cold and stranded! If it is not possible to feed by gravity, 12v or 24v pumps are available to feed the oil into the stove. For narrow boats with sufficient battery capacity feeding an inverter and/or land-line connections to AC, it may be possible to install a 240v pump. Consult the manufacturer as regulated oil pressure can be critical to the stoves efficient and safe operation. Due to the variable quality of red boat diesel, it is good practice to install a water trap in the Diesel Fired Stoves‘ fuel line. Always refer to manufacturers and BSS recommendations. Finally, pay consideration to your fire extinguisher and CO/smoke detector installations at the same time. Oil Fired Stoves… Keeping It Clean & Safe! Burners and flues will need to be de-coked and cleaned regularly. This will depend upon how often and how efficiently you use your appliance. Refer to your particular manufacturers instructions. If a decontamination filter or water-trap has been installed in the feed line from the tank this will need draining as part of a regular maintenance program. Keep all radiant surfaces clean and ensure all potential combustibles on your boat are kept well away from the heat source. Any seals and joints in the fire or flue should be regularly inspected and replaced or repaired as necessary. Diesel Fired Stoves are available in outputs from around 1kw (on low burn) up to around 8kw. 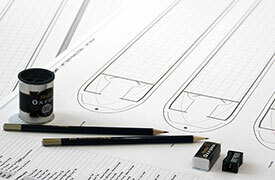 Ensure you specify the right value for your space on your narrowboat. Discuss your requirements with your specialist appliance supplier. Diesel Fired Stoves will use from approximately 0.3 to 1litre of diesel per hour depending upon their use and type. Consider this extra heating cost if you are planning on running the Diesel Fired Stove for 24hrs during winter to provide heating and hot water on board your narrow boat. Incomplete or inefficient combustion will produce carbon monoxide. Keep the stove, burner and flue in a clean, serviceable condition by regular inspection and maintenance. As with Solid Fuel Stoves, some models of Diesel Fired Stove can be plumbed into a radiator and/or domestic hot water system. A coil can be supplied with the Diesel Fired Stove to heat water which in turn can be fed into radiators or a calorifier to provide additional heating and domestic hot water. The simplest method of circulating hot water. Relies on a continuous upward flow of the hot water outlet pipe throughout the installation. The warm water rises through the pipework, cools as it drops through the radiator and is drawn back into the heater to be recirculated. These can be tricky to balance and are best used in the simpler systems where multiple radiators are not required. A low power consumption pump can be installed to circulate the water. This could run off the leisure batteries or a 240v domestic version could run off shore power or an inverter system. A supply of hot water can be achieved by plumbing the hot water outlet pipe from the Diesel Fired Stove into a calorifier. The use of calorifiers is covered in the Plumbing chapter of The Fit Out Pontoon. Would You Like To Buy An Oil/Diesel Fired Stove?